Gluten free cinnamon spiced hot cross buns with sultanas and currants. 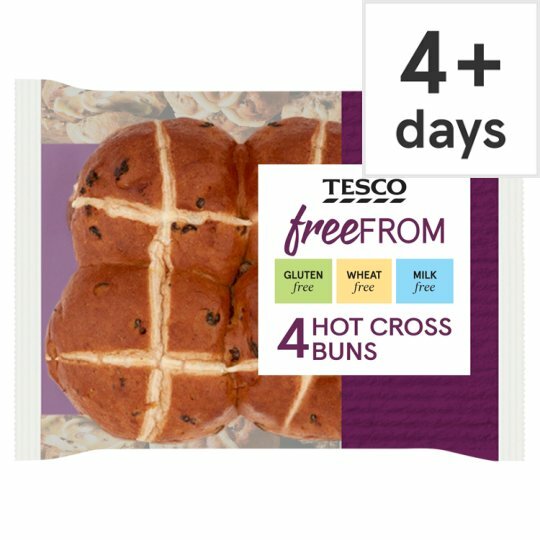 INGREDIENTS: Water, Sultanas (10%), Rice Flour, Currants (6%), Tapioca Starch, Caster Sugar, Maize Flour, Vegetable Oils [Rapeseed, Sunflower], Potato Starch, Bamboo Fibre, Yeast, Dried Egg White, Psyllium Husk Powder, Humectant (Glycerol), Stabilisers (Hydroxypropyl Methyl Cellulose, Xanthan Gum), Potato Dextrin, Mixed Spice [Coriander, Cinnamon, Ginger, Nutmeg, Fennel, Clove, Cardamom], Salt, Preservatives (Calcium Propionate, Potassium Sorbate), Cinnamon, Flavouring. defrost for 2 hours in a cool, dry place Once defrosted use on the same day and do not refreeze.